Queen of Pentacles is one who can look compassionately at the world, at her place in the world, and all that she’s accomplished or gained within the world (which may include owning her own business!). Pentacles represent Earth, and the Queens are extensions of the Empress and of maternal energy, so this Queen of Pentacles celebrates life (in all of its forms) on earth – the nurturing “hostess with the mostess”. If I could think of one phrase to describe this queen, it would be “well-manicured”, and I don’t just mean in regard to her fingernails. She’s well put together in her dress and lifestyle and delights in the material joys this life offers, and in sharing those joys with one and all. She shares her loving energy with those in her environment, including plants and animals, as well as friends and family. Inverted, this card is probably asking me to become this type of energy, is letting me know that this energy is beginning to manifest in me, or to seek out this type of energy in another. The personality of the Queen of Pentacles combines the positive earth energy of the Pentacles suit with the inward focus of a Queen. If you were to visit the Queen of Pentacles, the first thing she would say is, “Come in, come in. It’s great to see you. Have a bowl of soup!” No one is more welcoming and nurturing than she. Her greatest pleasure is to care for others – making sure they are happy and secure. Her home is always overflowing with children, pets, plants and footloose friends. She is warm and generous to all. In day-to-day matters, she is sensible and practical. She doesn’t have a lot of time for elaborate plans and other craziness. If something needs doing, she just takes care of it without a lot of fuss and bother. If necessary, she makes do with little and always comes through in a pinch. There is a down-to-earth, matter-of-factness about her. She is always loyal and steadfast. Because she is trusting by nature, others trust her completely. When you are hurting or in need, the Queen of Pentacles will calm your fears and share your troubles. In readings, the Queen of Pentacles asks you to think and feel as she does. For example: Are you feeling warm and caring toward others? Are you being sensible? Have you been true to your word? Do you feel generous? Can you be counted on when times are tough? This Queen can also represent a man or woman who is like her, or an atmosphere of warmth, trust and security. In a reading, she tells you that her special energy has meaning for you at this time. Let yourself be inspired by this Queen in whatever form she appears in your life. The element of Queens is water and, not surprisingly, they are a reflection of the Empress. In this they signify the creative force. One way to think of the court cards is this: The Kings are the motivating force (Fire = the sun waking up the sleeping Earth). The queens are the ones who make it real (water = rain bringing forth life from the earth). The Knights spread the idea of the Kingdom (wind = spreading the seeds). And the Pages, of course, are the fertile soil in which all of this can grow. 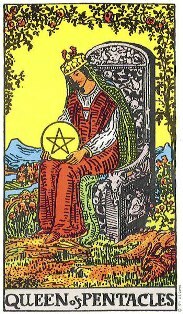 Queen of Pentacles – Making real a business, altering a work situation, or developing an exercise or health plan. This is the practical, down-to-earth woman. An enthusiastic outdoors woman, she’s always encouraging friends and family to exercise. She also owns her own successful business. Her accounting is scrupulous, but that doesn’t mean she’s afraid to spend. She loves beautiful things and has an artist’s eye. Her home is impeccably decorated with paintings, furniture, and trinkets. Her garden is also beautifully maintained. Tasteful is the perfect word for her; likewise in her dress, jewelry and make-up. As in work, nothing less than giving her all to her family will do for the Queen of Pentacles. She wants them to have the best so they can succeed. But this can put a lot of pressure on them. The queen does not understand that buying a child a Steinway piano will not make them Beethoven; also, this Queen’s pragmatism, her dislike of anything strange or distasteful, may exclude anything unique or imaginative – solutions as well as people. Her children or partner feel that they can’t be themselves and still be loved. A down-to-earth woman known for her financial acuity; nurturing; one who enjoys the out-of-doors and gardening; one who saves; financial fertility, puting practical ideas to good use. As a Temporary Vibration: Friends, money, travel. This period deals with the material aspects of life and the pleasures and comforts derived from it. Money and possessions are accentuated. You will gain more affluence and prestige in some manner. An influential friend may assist you, or you could receive an inheritance or promotion. The courts and the legal profession could be involved. Educational pursuits will bring wealth and influence. If you have dreamed of a special vacation or trip, you will now have the funds to fulfill that desire. Enough money is available for you to feel opulent and secure. Your mind is very active now. Channel this energy to create a successful business or otherwise bring about tangible results. TAROT SYMBOLISM: The Queen is dressed in an elegant but conservative costume, which befits her character. Her throne is decorated with symbols of fruitfulness. The goat, symbol of Capricorn, is carved into the arms of the throne. Flowers are in bloom all around her. The hare is also a symbol of fertility and productiveness. Cherubs always indicate the protection of divine beings, who radiate love, peace, happiness and contentment. ASTROLOGICAL CORRESPONDENCE: Second decan Capricorn. The second decan of Capricorn, (Taurus dominant, Earth and Venus co-ruling), produces not only a practical individual with an eye on financial gains and prestigious positions, but also a determined, loyal and sometimes stubborn individual. It would be hard to imagine anyone with these qualities who would not become successful in whatever endeavor he or she chose. Certainly, with this card, this is the case.